You need to have PostgreSQL server (version 8.0 or higher is required) with PostGIS enabled (http://postgis.refractions.net/), dotConnect for PostgreSQL Professional and VS 2008 SP1 for using PostGIS with Entity Framework. For efficient use of geometry types you need to have a set of .NET classes representing them. For example, let it be SharpMap. As an alternative, GeoTools.NET or .NET Topology Suite can be used. Open the Trunk part of the project. Remove all projects and leave only SharpMap.VS2008. Go to the PostGIS.cs file and run Find And Replace dialog. Change all Npgsql entries with PgSql. SharpMap is ready for work with Devart Entity Model now. Add the compiled SharpMap.dll to project references. Right click the Solution Explorer and select Add new item. In the appeared dialog choose Devart Entity Model from the Data page. Create database connection in Database explorer and drag&drop objects, contained geometry data, to the diagram. In our example we use table Towns which contains the_geom column. Note: You can build Devart Entity Data Model in a stand-alone EntityDeveloper application or in the application integrated to the Visual Studio. The screenshot above applied to the stand-alone application. As we can see, the geometry column in SSDL is already mapped to Binary column in CSDL. So, we are ready to work with C# code templates. Choose Templates from the View menu for Tempates Browser viewing. Create a new template by clicking the “New…” button (call it “PostGIS Entity C#”, for example) and select Entity C# in the “Load from existing template” drop-down list. 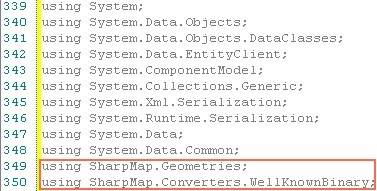 Don’t forget to add SharpMap.Geometries and SharpMap.Converters.WellKnownBinary to the using list. We have finished code template creation. Don’t forget to set up your custom Entity template as the common template of the model (to do it open “Project Properties” dialog and select this template in the “Template” drop-down list). You can generate source code now (just save your model in VS or click “Generate” button in a stand-alone mode). However, we still have a problem. The changes made to our Geometry entities will not be tracked. The reason is that Geometry wrapper property is not a primitive type property and thus don’t support the default change tracking. The second way is to use the SavingChanges event to iterate through all the Unchanged entities and check which of them has changes in the binary underlying property. This approach is really slow, but it does not make user to seek for the every possible change in the code. And don’t forget to add the handler for the SavingChanges event. So, now your application is ready to work with geometry objects. Give it a try! We will add the necessary corrections to the article as soon as possible. Any chance this could be updated to recent versions of VS/EF/PostGis? The concept is very interesting, but i do not have enough knowledge of EF to figure out what is broken.